Whoa. I've been gift-making. Feels like Christmas around here. This is why I don't do handmade Christmases - already burnt out by the summer before. That's not to say that I don't enjoy making and giving handmade things - it's just that I am such a fabulous procrastinator that I get stressed. And where is the fun in giving when one is stressed? So I say no, unless it's for a very special person. These are the gifts I made for Grandma i.e. technically, they are gifts for my Mum, but they all went in the same package as Emily's quilt. First are new straps for Mum's Swatches. I wish I had the watch faces to show you, but they're in Singapore. Had to get Mum on skype to show them to me, so I could match fabrics to them. Hooray for skype. Dad also requested a custom feature - a loop through which to put the pin of the buckle. So Mum's straps will have real plastic Swatch buckles (to be installed by Dad in Singapore), not the rectangular split rings that I used for mine. Notice though, that I didn't make the usual fold-over sort of loop. 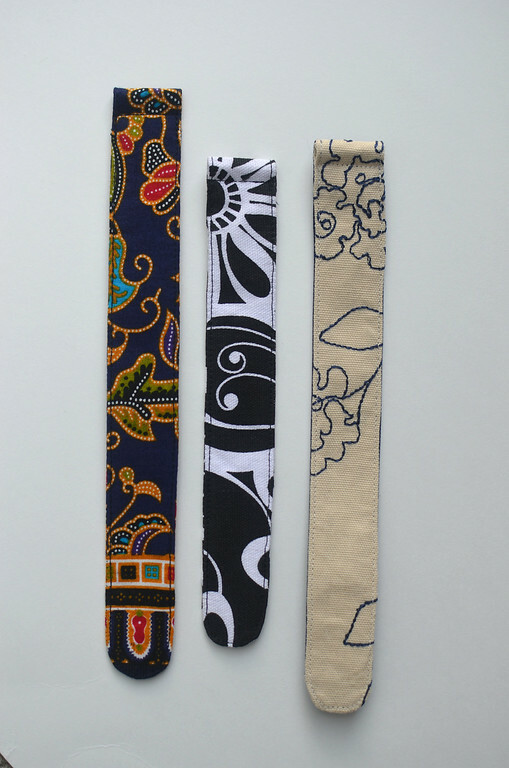 I'm trying to phase out those from my straps in general because they look unprofessional, homemade and automatically relegate one side of a strap to the "wrong side". 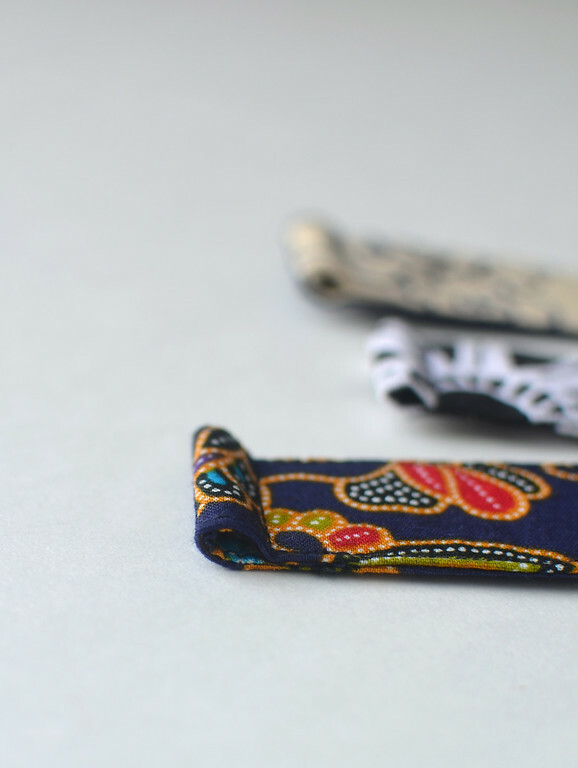 I think that to make a truly reversible strap, both sides have to equally look like the "right side". 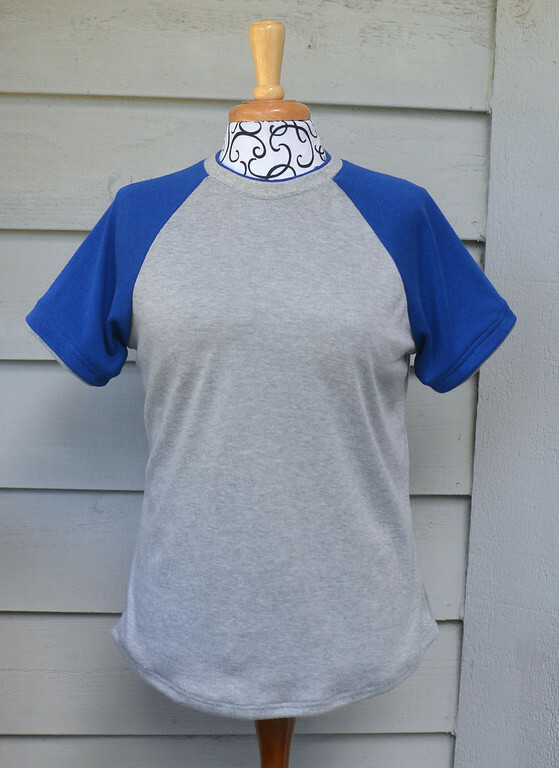 Next is a raglan tee. Mum and I are roughly the same size and quite similar in shape, so I imagine my raglan pattern will fit her. Mum has always had a soft spot for these double collars. 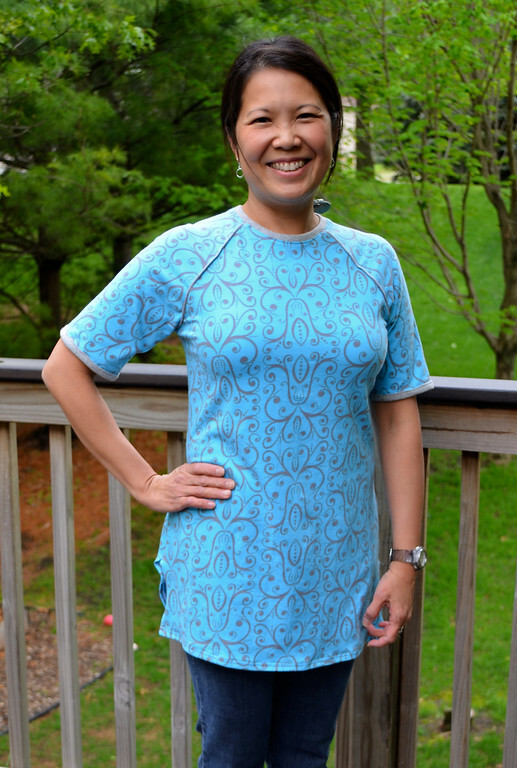 And while I was at it, I also made double sleeve hems, to match. And, completely unrelated, here is a Tshirt I made for me, because it took next to zero time to cut out a second shirt from the same pattern. I had a yard of this nice knit and I'm learning the hard way that a yard is a pretty much useless amount of fabric to buy for any garment. It's too little to do much with for an adult, and too much for one child's garment but too little for two. 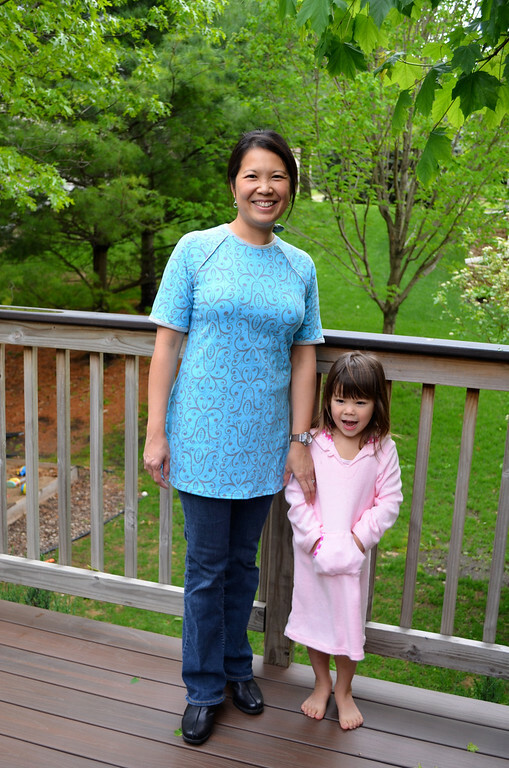 Three-quarter yard is a perfect amount for a woman's skirt, one-and-a-quarter is perfect for a woman's dress and for two kids' garments in general. But most online fabric stores sell their stuff in half-yard increments, which translates to annoying remnant bits that are too big to toss and too small to do anything with. At least if they were quilting cotton or home-dec, one might conceivably make coin purses or patchwork table runners or coasters, but apparel fabric? I'm thinking headbands, but nobody older than 10 should wear a print garment with a matching headband. and bound the sleeve hems. This is my "I had to wake up in the middle of the night to carry the kids to the basement because the county sounded its Foul Weather Siren at 3 am" face. Man, I need sleep. Did you notice the side slits looks wonky? That's because the fabric was shaped a bit too funny to actually meet at the side seams below the hip. So I had to make slits. I'm thinking that if I eventually hate this tunic length - or if that curly slit drives me nuts, I can chop it off at the hip anyway. 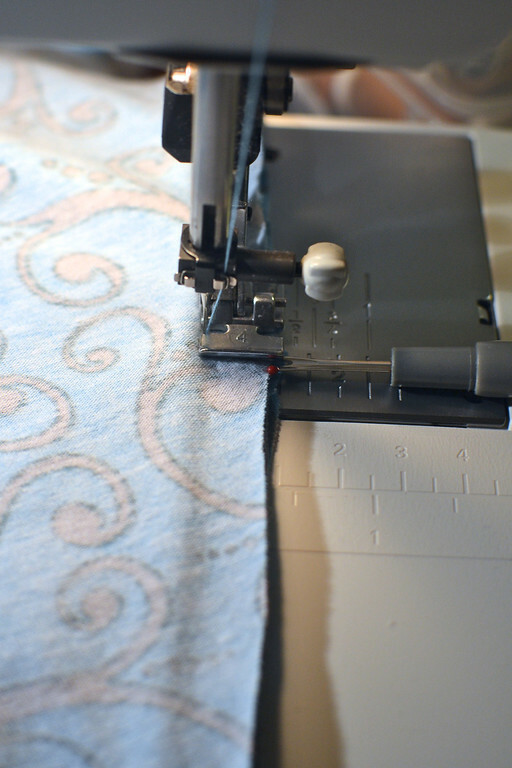 Want to learn a new sewing technique? See that trim? It's not piping, by the way. Piping would be too stiff on a knit garment like a tshirt. It's just folded trim. Can I teach you how to make it uniform, even and perfect? To do it, you need to make some piping. No, I'm serious. Be patient and watch. Make your piping, as I said. With knit, you don't need to cut your fabric strip on the bias because the knit is already stretchy enough. In fact, to prevent everything from stretching too much, I deliberately cut that fabric strip so that the stretch was perpendicular to the length of the strip. Use long stitches, because you're going to pull them out later. 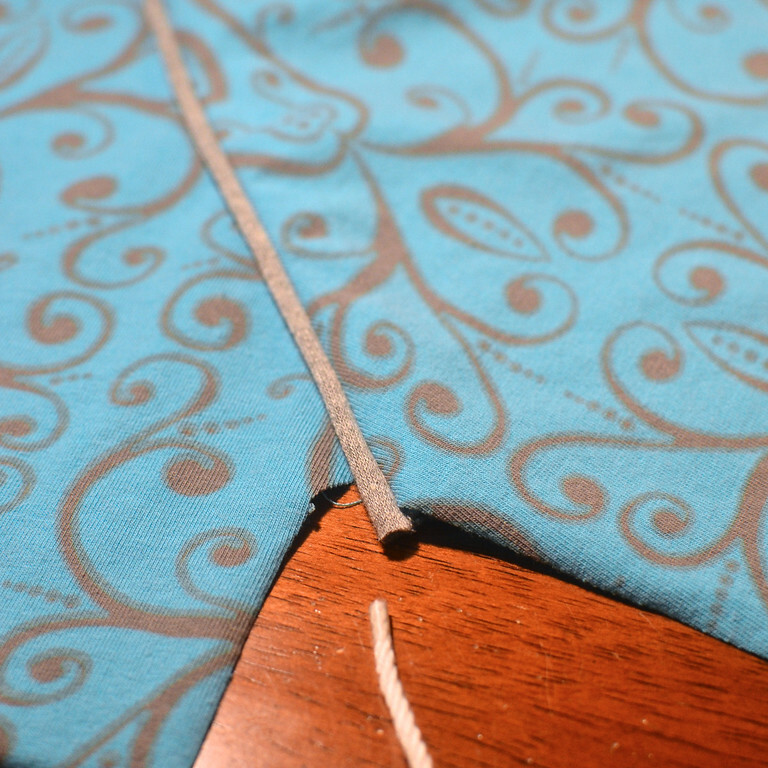 Next, sew that piping onto one piece of fabric that's involved in the raglan seam. In this case, this is the back of the Tshirt. Again, use long stitches. Think of it as basting. 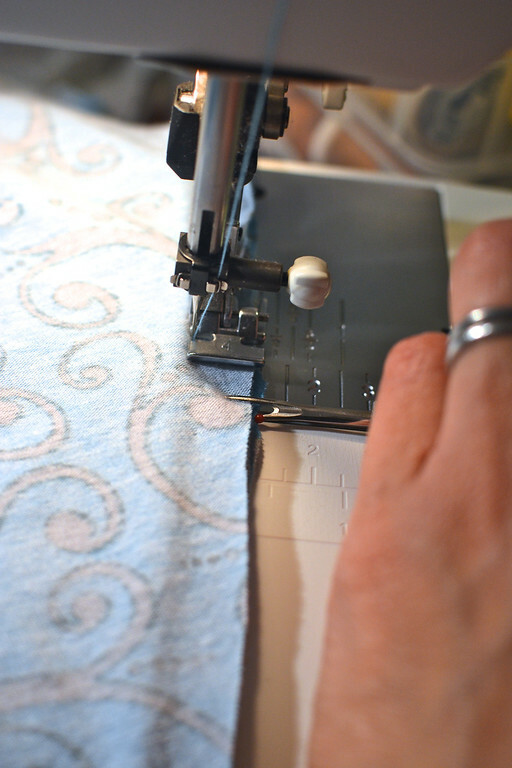 When I make and attach piping, I often sew lines of stitches that are increasingly closer to the piping cord with each stage. 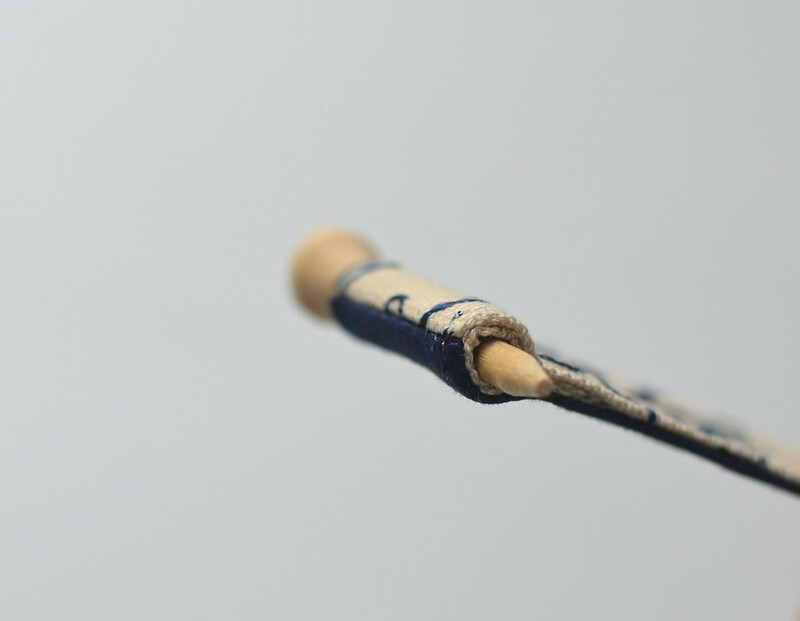 I can do this by changing my needle position - but I am not sure if every machine can do this. 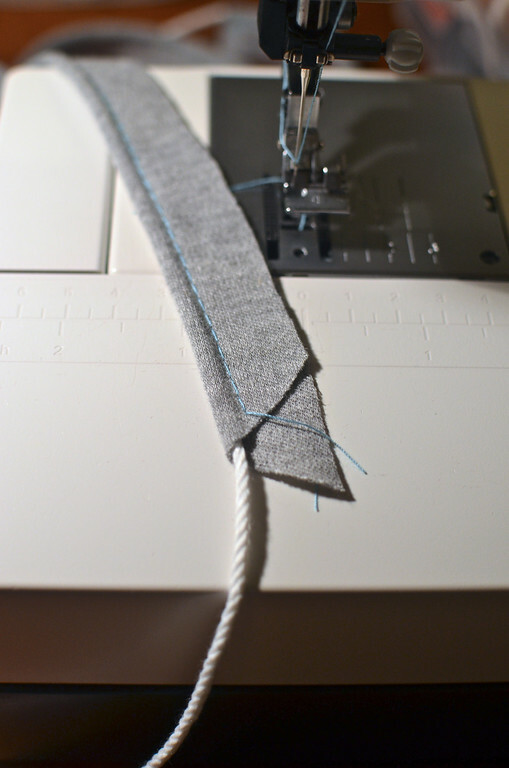 This just allows me to hide all the intermediate stitching lines behind the actual seam line in the last step, so that no stitches from earlier steps are visible on the right side of the seam in the end. Then lay the other piece of fabric (in this case, the sleeve) on top of all that, and sew to attach. This time use short stitches. You'd want to have your foot (I used a zipper foot since I don't own a piping foot) hug the piping cord tightly, just as if you were sewing piping. 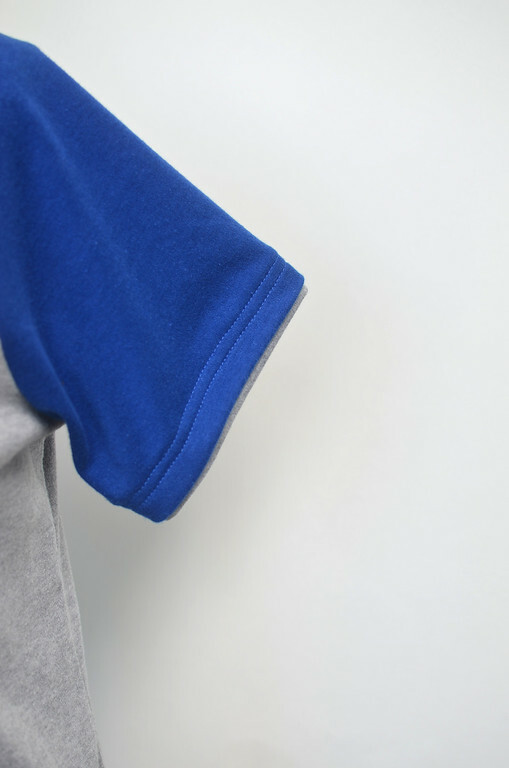 If you have worked with raglan sleeves, you will know that the raglan seam is diagonal-ish, which means it is cut along the bias of the fabric. 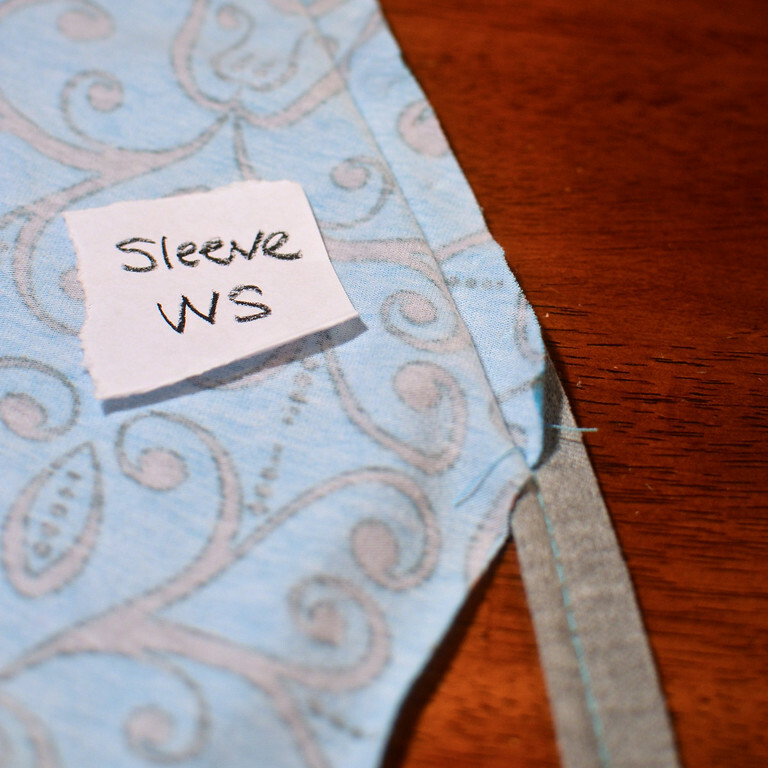 This means it's nice and stretchy, which is wonderful for Tshirts, but it can be tricky to sew without stretching. Especially if you are using a zipper foot (uneven pressure because one-sided) and sewing layers like this, plus piping besides. So I use a method called "easing" that I use for all sensitive bits of garment sewing, like set-in-sleeves and necklines and princess seams. Here we will digress a bit so I can show you this Easing Technique in action. I introduced it first in that weird seam ripper post here (see points #9 and #10). Even with my fully-engaged walking foot, the top layer of this raglan seam is likely to stretch and pucker. So I use my seam ripper to push the top layer of fabric under the zipper foot as I sew. Between the walking foot that pulls the top layer backwards and my seam ripper pushing it forwards, it moves in complete alignment with the bottom layers. 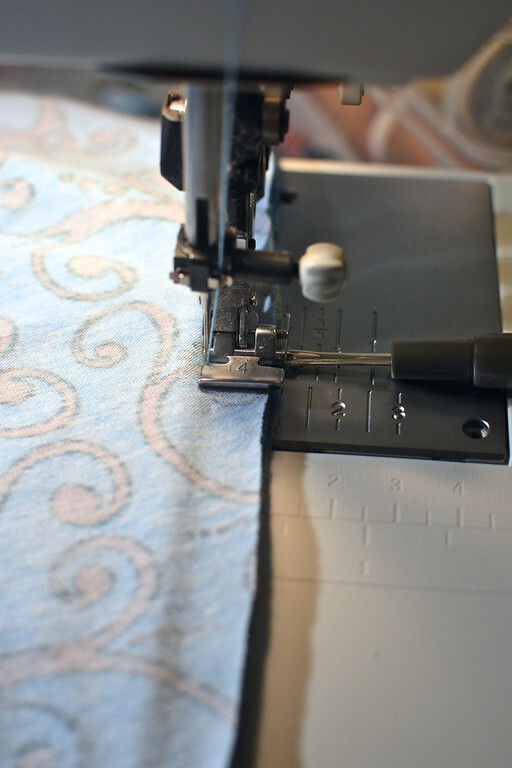 When the seam ripper has emerged behind the foot, I reposition it in front again, for the next segment of fabric. This happens every 2" or so along the fabric, and I don't pause sewing in order to do it. It's a continuous thing. 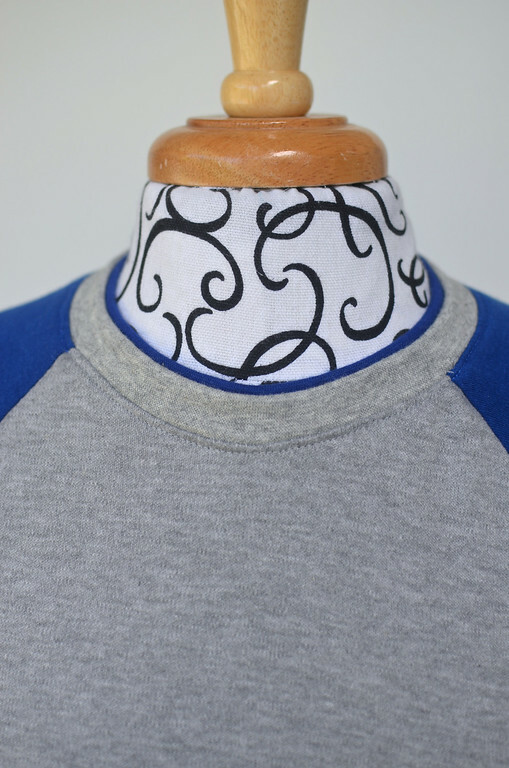 So now you have sewn piping into the raglan seam. See- here is how even and perfect it looks on the right side. Now pull out the piping cord. 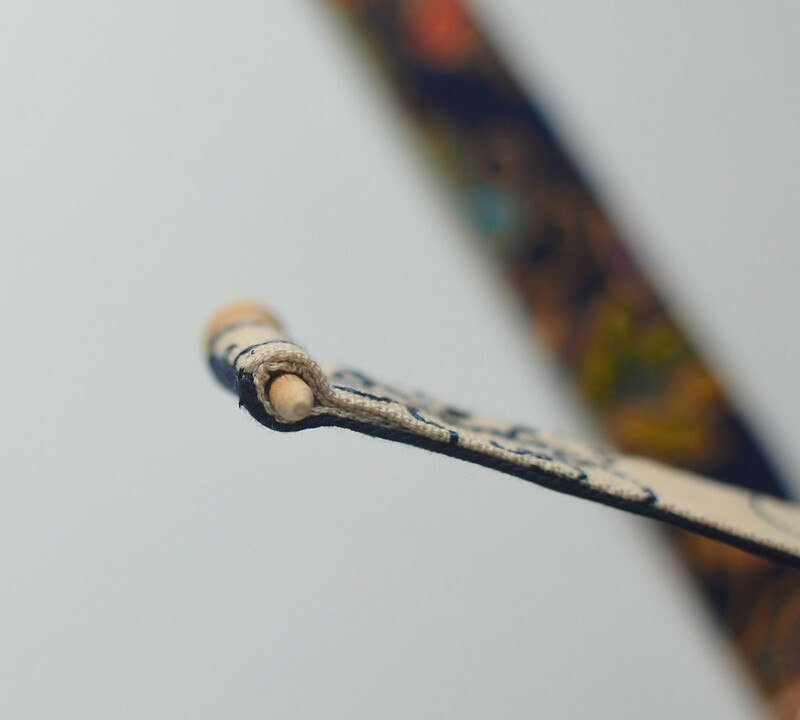 You will have perfect folded trim, because the solidness of the piping cord helped guide your zipper foot to make it uniform. If you counted, you would have sewn three lines of stitches to make this seam. All those stitches mean this is a very stiff, rigid seam that won't stretch with the rest of the garment. So pull out the two lines of basting stitches so that you only have one line (the last one, with the short stitches) left. 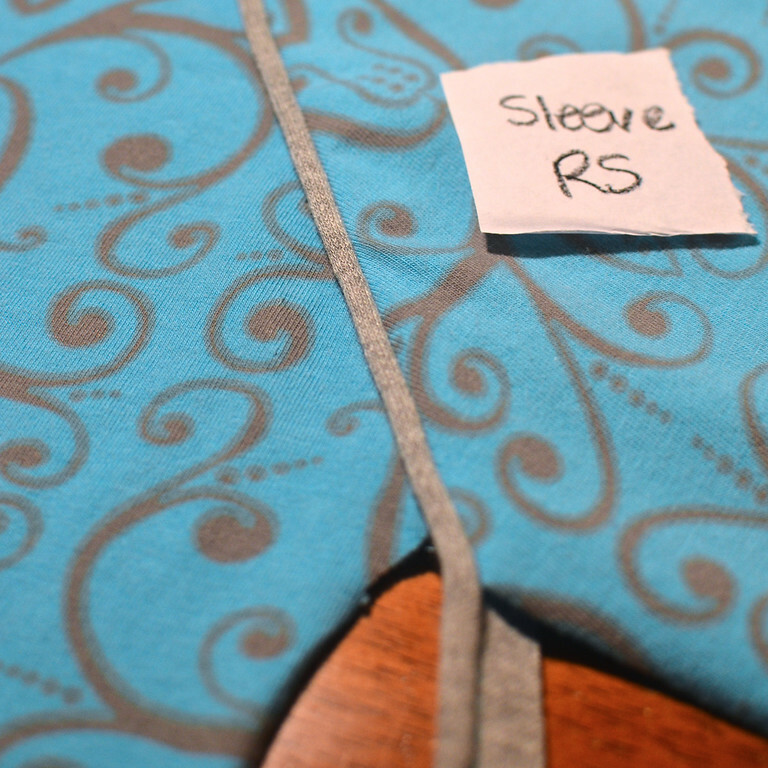 The final seam will be straight, flat and with a bit of give i.e. slightly stretchy, as is appropriate for a knit garment. Easy. I have two more Gifts Posts to impose upon you. But before that, something quite entertaining coming up! Your tunic is fantastic. 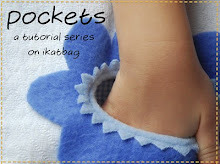 Great tutorial and extra tips, too, thanks! What a wonderfull shirt, I love the colours! Thanks for the tutorial on piping / trim. I'm still working up the nerve to try sewing knits. Your new tee is a beautiful nudge in that direction. I admire everything you make LiEr, but if I could pick only one thing, well, Fleur would be my favorite. 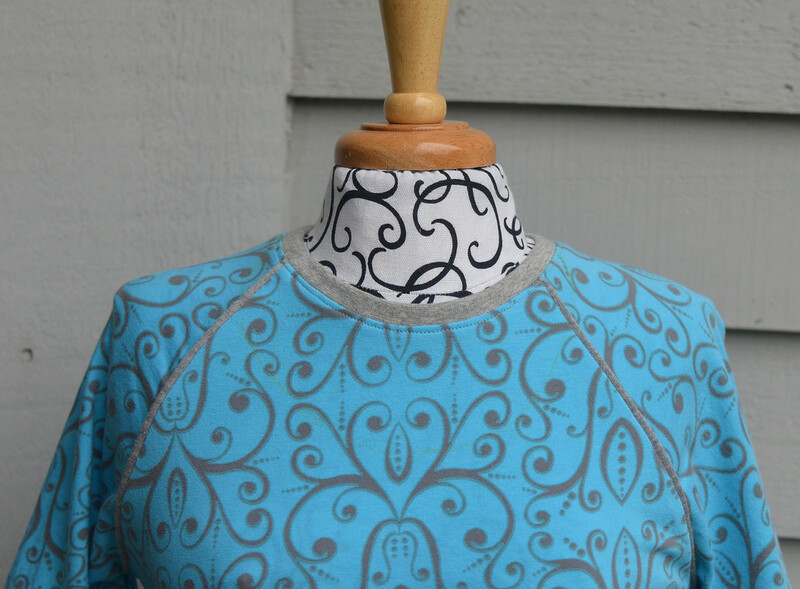 I wish to make one for myself, since due to scoliosis my shoulder are unfortunately uneven, and having a mannequin would help so much in shaping the garments correctly to compensate. 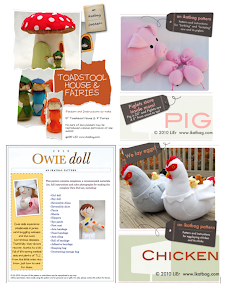 You are such an inspiration that I might try to make one. And thanks for teaching this technique for trim! Thank you, Anna! I hope someday you will be able to find or make a mannequin to help you! I do enjoy using Fleur, mostly for photographing the clothes I make. But she has been helpful for checking my back fit, too, and other bits I can't see in a mirror. Thank you. 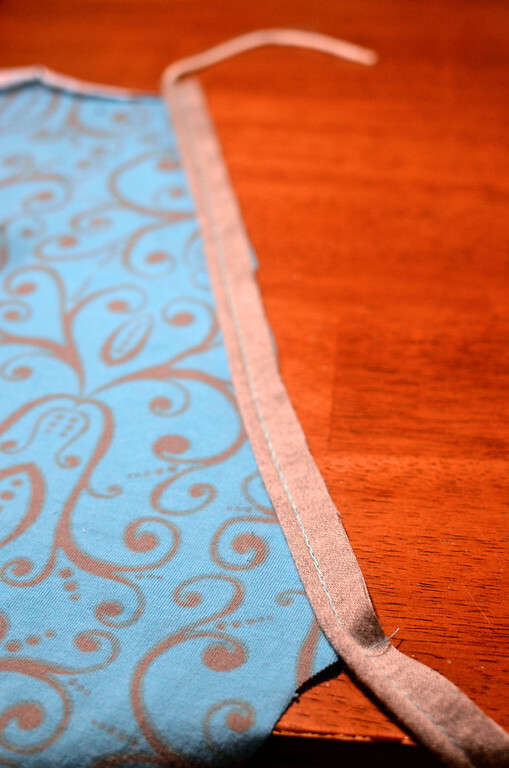 The tip on sewing flat trim is timely. 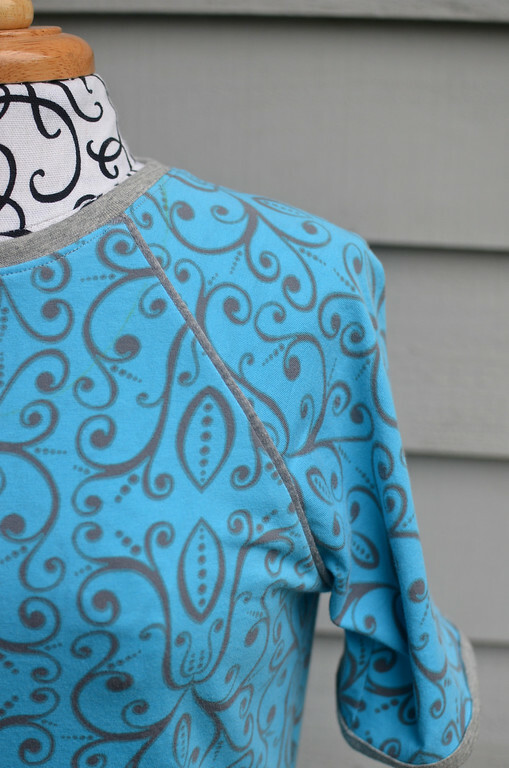 I love the trim on the sleeves of your knit tunic! USPS, definitely. I often use their flat rate envelope and shove as much as I can in, if it weighs more than a pound. For less than a pound, I just send it first class. This is fantastic. 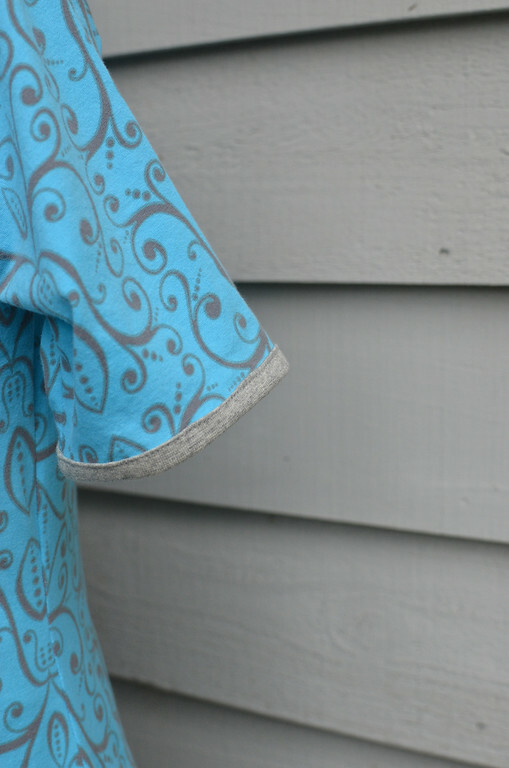 I love just about everything about the shirt you made for yourself, especially the tutorial! those are really nice raglans! 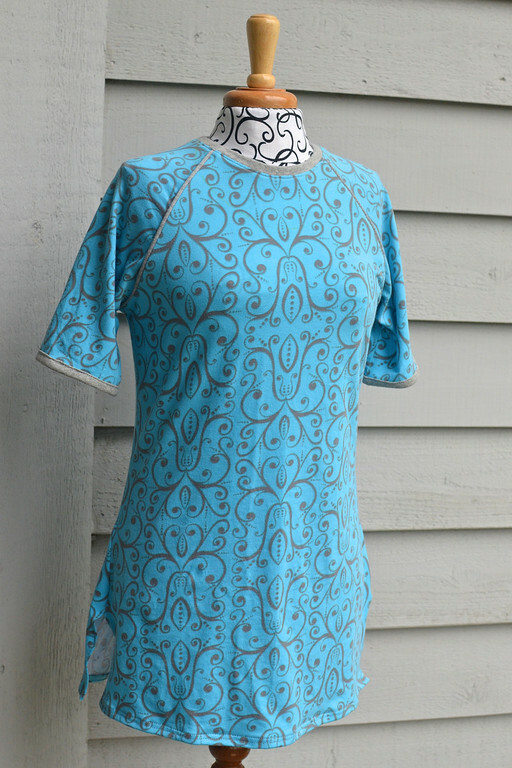 I need to make some with 3/4 sleeves for knocking about -- I have one that I have had for about 10 years that is my favorite to wear in the winter-to-spring wierd weather, it's a baseball jersey but I just can't find anything else that fits the same. 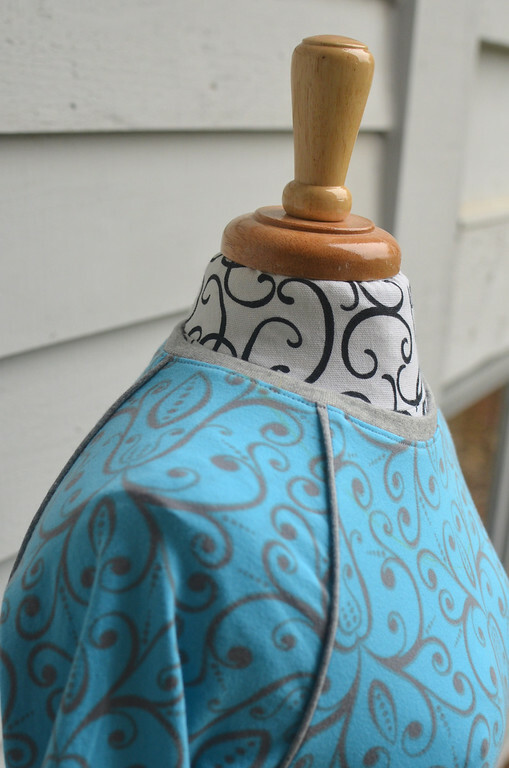 I love that blue fabric with grey swirls. Thanks for this wonderful tutorial! I love the details you added to this t-shirt.